‘…one of my greatest joys is seeing the Lord use songs to challenge and encourage hearts for His purposes and His glory. I was thirteen years old when I wrote my first song. Little did I know, that tune was the beginning of a journey that I pray will one day usher me all the way to the Gates. I am a firm believer that the power of an effective melody, coupled with the truth of the Gospel, is a force that can be used to change the world. To be honest, it’s not the music that really excites me. I love the music, but what fuels my soul is the relationship that the music brings. And more importantly, the purpose behind the songs that we sing…’ Powerful words from indie worship leader, Erik Nieder. In fact, close your eyes and listen to his voice. Seriously. Doesn’t he sound like lead singer of Tenth Avenue North Mike Donehey, and lead singer of Jars of Clay, Dan Haseltine, at once? In fact, that was probably one of the reasons why I started listening to this album. That and the fact that his song “Dead Man Walking” was covered by John Tibbs, new signing to record label Fair Trade Services. With a trademark ethereal voice, and songwriting skills equally as poignant and emotive as many artists on record labels (think artists like Tenth Avenue North, Jars of Clay, Jadon Lavik, Phil Wickham etc. ); it’s only a matter of time before Erik is signed. With each melody possessing a hymn-like quality, making this album full of songs that could easily be catalogued as modern hymns in the future; it is the acoustic nature of these 9 melodies that enhance the album as a whole. 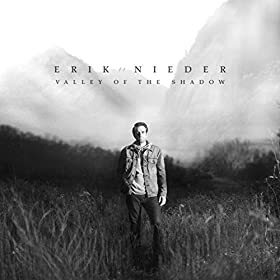 With just acoustic guitars, the piano, light percussion and Erik’s voice, Valley of the Shadow is one of my favourite AC/Insp albums I’ve heard for a while, ever since I Am They’s debut album way back in January 2015. From Erik’s Easter single “Glory and Grace” to well-known melody “Dean Man Walking” and current single “Made”, this is a project not to be missed if you enjoy artists like Tenth Avenue North or Jars of Clay. Released to radio not too long ago (I think it was last month), Erik’s current single “Made” is as tranquil as it is powerful, littered with acoustic guitars and Erik’s soothing voice. Perhaps one of the most underrated voices of the last few years (yes, such a bold statement after only listening to Erik and his album for a few weeks, yet I stand by my statement), it is his similarity vocally to Dan Haseltine, Mike Donehey and Jadon Lavik that will work for Erik in months to come. As drums and a gang of backing vocals start to be present in the song as it goes along, the theme of “Made” is as heartfelt as ever- that God makes beauty in every circumstance, even in the brokenness of our lives. Erik’s heartfelt cry that ‘…Your light shines in the darkness, Your grace gives hope to the hopeless, Your beauty bounds in my brokenness, in my brokenness…’ is something we ought to hold onto, especially during the times where we may not even believe the truth ourselves. “Dead Man Walking”, while not a single by Erik, was actually rerecorded by new CCM artist John Tibbs for his upcoming Fair Trade Services release later on this year (or is it next year), with “Dead Man Walking” the first single. With Erik’s original version of the track boasting a rawness that sadly is missing from John’s version, Erik invites us to partake in this acoustical melody where he opens up about how we, covered in sin, are indeed dead man walking, until the day when ‘…Your love, Your love oh it set me free, no guilt, no shame, got no hold on me…’ As poetic as it is enriching, this is a song destined to be enjoyed and loved because of John’s rerecording, and maybe, just maybe, Erik’s music will become more known because of this. “Glory and Grace”, the remaining song to be known prior to this release, was available in 2014 as an Easter single. In fact, many of the Easter songs of the past were written in the style of hymns (“In Christ Alone”, “Calvary”, “Man of Sorrows”, “Jesus Paid it All”, “Cornerstone”), and “Glory and Grace” is no different. In fact, dare I say that this melody is by far my favourite song written about the topic of Easter? The chorus is as poignant as ever, as Erik relays to listeners that ‘…with nail-torn hands and spear in side, the wrath of God was satisfied, on the day my sin You became, oh my God for Glory and Grace…’, as we are reminded of the gravity what it means for the God of creation to take our sin from us and make a way back to Him. With “Glory and Grace”, along with “Dead Man Walking” and “Made” anchoring the album as a whole lyrically and musically, Erik ought to be commended, for such a powerful melody that is by far my favourite worship song I’ve heard since Lauren Daigle’s “First” in April 2015! “Brick By Brick”, the song sandwiched between “Glory and Grace” and “Dead Man Walking”, is as compelling and enjoyable as both these songs, as the keyboard and pulsating drums take centre stage as Erik invites us to be the humble servants God calls us to be- and that even if things take ‘brick by brick’, we ought not to be closed to what God longs for us to be and do, but rather have outstretched hands and willing hearts to be used by the Lord in whatever purpose He wants us to accomplish. It is the lyrics of how ‘…I know I’m not but I know I AM, I cannot but I know who can, I am not but I know the Great I AM…’ that stand out in the song, and it is by these lyrics alone that hopefully will encourage listeners to not only listen to the song but to the rest of the 8 tracks as well. “Winding Road” again strips down the melodic influences and allows the acoustic guitar and Erik’s voices to speak a theme of journeying down toward the unknown, along a winding road with twists and turns and uncertainty. A song a tad over three minutes with a comfort knowing that whatever road we take will always be with God present; Erik continues with emotion and encouragement, from declaring alongside the acoustic guitar that the life we lead be a light that people see straight to Jesus (“Light of Your Love”), and presenting to us a modern day ‘Leaning on the Everlasting Arms’ of sorts, as Erik encourages us to stay a while in the arms of God, especially in the moments ‘…when all hope seems dead and gone, won’t You be my strength to carry on, when I can’t stand on my two feet, in thy gentle arms, won’t You carry me…’ (“In Thy Gentle Arms”), to “Be Not My Own”, a 3:20 song that is a prayerful melody that allows us to declare that everything we have to be the Lord’s, and what we have to be God Himself, our Father, Saviour and Friend who stands beside us in the battle which is this life itself. Erik also invites us to hear a duet in “Wayward Soul” with friend Dinah Smith, a song with finger clicks, hand claps and a swaying beat about God’s love and how it even extends far to the wayward soul, even if they don’t believe it themselves. It is the repeated lyrics of how ‘…He loves you more than you could know…’ that ought to encourage, even the wayward soul, of God’s outstretched love that covers a multitude of sins and regrets. Well done Erik for such an enjoyable duet, and one of my favourites on Valley of the Shadow! ‘… one of my greatest joys is seeing the Lord use songs to challenge and encourage hearts for His purposes and His glory. I was thirteen years old when I wrote my first song. Little did I know, that tune was the beginning of a journey that I pray will one day usher me all the way to the Gates…so when people ask me, “Why music? Why songwriting?”… because nothing can perform soul surgery quite like a song can. And no one can heal a heart quite like Jesus can…’ One of my favourite indie artists I’ve heard since others like Julie Elias, Kaleidoscope and Joy Lippard; Erik Nieder is as talented as he is compelling in his songwriting. Fans of Tenth Avenue North and Jars of Clay are sure to love Valley of the Shadow, as will lovers of artists like Phil Wickham and Jadon Lavik. From current single “Made” to Easter single “Glory and Grace” and the John Tibbs-made-famous “Dead Man Walking”; this is a collection of songs full of heart and soul. A worship leader destined to be part of the next generation of worship songs in months and even years to come, well done Erik for such a prolific and defining album. My favourite worship album since Lauren Daigle’s How Can It Be, Erik is sure to be on the radar of music executives and record labels in the upcoming months! Kudos to Erik, here’s to the next album whenever it comes! Wow! What a stellar review. Thank you for taking the time to listen and for such kind words. Grateful that you’d say such wonderful things about aerial and the record.